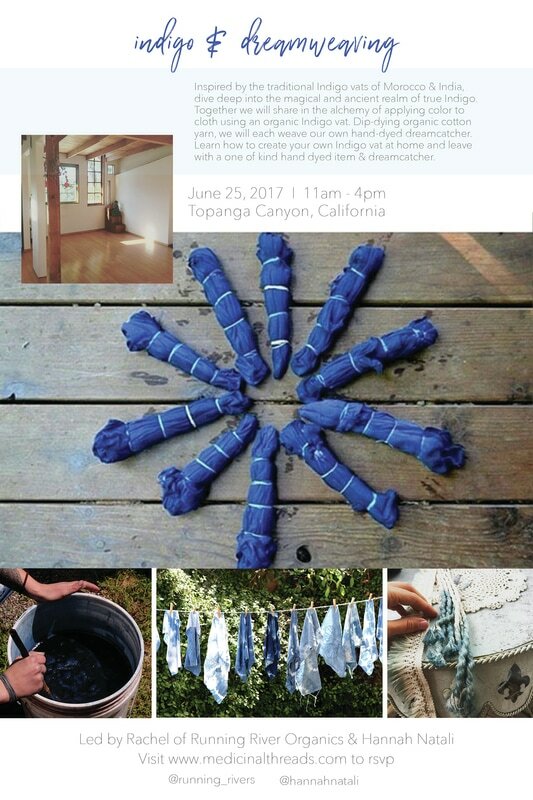 Join us for an indigo dying workshop! 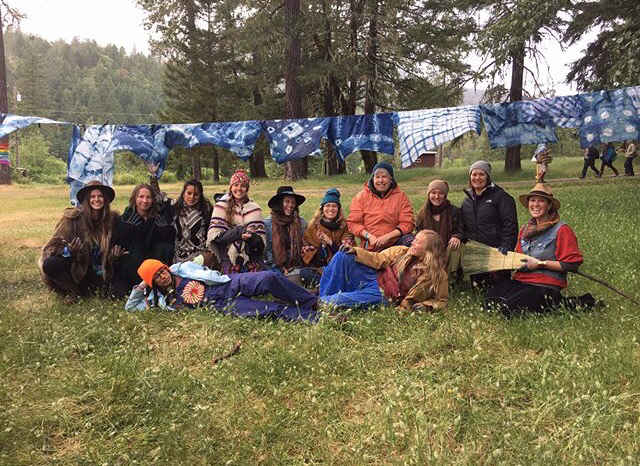 WHERE: The barn at OAEC, 15290 Coleman Valley Rd., Occidental, CA. Park in the upper lot by the greenhouses and walk down the road, through the deer gate, to the barn. You can’t miss it. Coming from Occidental, head up Coleman Valley Road. You’ll pass the main Occidental Arts and Ecology Center entrance about ½ mile up, keep going and turn in the next driveway to the right. ​do not mind getting dyed! SIGN-UP: Space is limited. To register, email Katy at katy@sonic.net. Any questions, call Katy at (707) 239-8879(logistics) or Rachel (materials or indigo questions) at runningriverdesigns@yahoo.com. 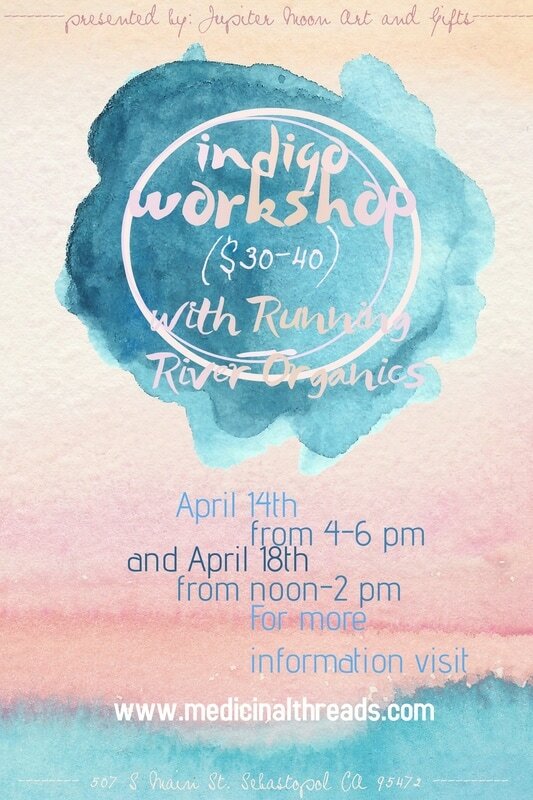 LEARN HOW TO CREATE YOUR OWN INDIGO VAT AT HOME AND LEAVE WITH A ONE OF KIND HAND DYED ITEM & DREAMCATCHER. ORGANIC COTTON CLOTH, ROPE AND SUPPLIES FOR DREAMCATCHER WEAVING WILL BE PROVIDED. YOU'RE INVITED TO BRING 1-2 SMALL PERSONAL ITEMS TO DYE. FRESH ORGANIC BRUNCH, FRUIT FRESCAS, AND RAW TREATS PROVIDED. For anyone interested in learning more about indigo and natural dyeing. Bring your own cotton fabric or clothing to dye and leave with a one of a kind indigo piece of art! $30-40 sliding scale, materials, gloves and extra fabric will be provided. Please wear something you do not mind getting dyed! Space in limited to 8 people per day please contact runningriverdesigns@yahoo.com or jupitermoonart@gmail.com to sign up! We love collaborating and meeting new friends! If you are interested in hosting a workshop or would like to create together let us know!